"The last sounds to reach their ears were the creak of tank tread and the battle-cry of Ta'aurc." Valus Ta'aurc is a Cabal Colossus boss in Cerberus Vae III strike mission. Ta'aurc is the commander of the Siege Dancers, though he is a member of the Dust Giants, and is infamous for conquering more land on Mars than any other Cabal commander. "Find the source! Rouse the Flayers and find the source!" Ta'aurc led his forces in attempting to secure Meridian Bay against the Vex. During a pitched battle against the machines, both sides suffered heavy casualties when a orbital bombardment directed by the Warmind Rasputin struck the battlefield. Outraged by the unexpected assault, Ta'aurc roared orders to his soldiers to have the Psion Flayers locate the entity behind the orbital strike. Years after his death at the hands of the Guardian, Ta'aurc was brought back to life by the power of Xol, Will of the Thousands, who had established himself among the Taken on Io following his own death. Ta'aurc was then Taken, and became Ta'aurc, Aspect of War. He is the final boss for the Cerberus Vae III Strike, where the Guardians battle against him within his base of operations, an Imperial Land Tank. He is armed with a Heavy Slug Thrower and Rocket Pods, and is supported by Skyburners Legionaries, Phalanxes and Psions. His Heavy Slug Thrower fires faster and has higher accuracy than those of standard Colossi, allowing him to suppress Guardians with ease, even at long range. He will continuously fire this weapon to prevent them from moving out of cover. On top of that, he can launch bigger barrages of missiles than a normal Colossus can (up to eleven), and is thus capable of swiftly destroying his targets. Getting too close to Valus Ta'aurc will trigger his "Quake" ability, where he performs a ground stomp that creates a massive shockwave, which is, more often than not, an instant kill. Valus Ta'aurc is also infamous among the Destiny community for being labeled as a bulletsponge due to his habit of absorbing unrealistically enormous amounts of punishment. Upon entering the room, Valus Ta'aurc is fully immune to all damage until the doors behind him are fully closed. 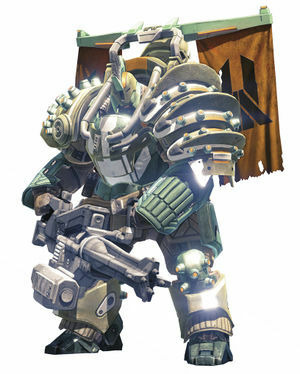 Until the Rise of Iron expansion was released, Valus Ta'aurc was immune even after the doors behind him were completely closed. This was fixed in Rise of Iron but he still can occasionally be invulnerable for longer periods of time than usual even after the door is closed. Concept art of Valus Ta'aurc.